It was popular game among guitar geeks in the Eigtites: who is the better guitar player? 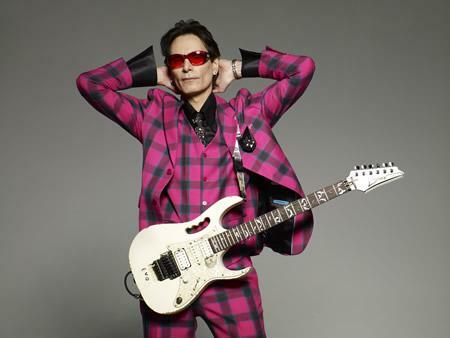 Steve Vai or Joe Satriani. Vai played with Zappa as his resident stunt guitarist, Satriani was far more prolific as a composer and scored a surprise hit Surfing With The Alien. The debate has died down since then and it's a draw when it comes to dexterity and fluidity. They will be sharing the stage again this year during a G3 tour with Steve Morse. Vai's new album The Story of Light is a hodgepog of styles: a gospel tinged cover of the Robert Johnson classic John The Revelator followed by the more over the top Book of The Seven Seals with a choir stragith out of a musical New Age tinged noodlings - Creamsickle Sunset, heavy-handed prog-rock (The Moon and I) and a big balls arena anthem (Gravity Rock, ). Via was never much of a singer and God knows what possessed him to add his voice to > No More Amsterdam, a duet with Aimee Mann. Vai has come up with a concept album that lacks direction. It's ambitious for sure and it sounds great. It may be obvious to himself what kind of enlightenment he is going on about, but he shuts out the casual listener with musical walls that are as high as that of Jericho. And rumor has it that those didn't stand the test of time either. The Story of Light wil be released on August 14th via Favored Nations Entertainment.